Buying a new or used car can be a pretty stressful experience. Used car purchases may be even more stressful than the new cars as now you have to consider the condition and history of the vehicle. Add to that dealers and sellers that may not disclose the whole truth about the vehicle and you begin to wonder why we buy cars to begin with. But the car buying process doesn’t need to be stressful and you, as a buyer, can be well informed in what to look for in a great used car by attending the Jay’s Auto Repair: How to Buy a Great Used Car clinic. 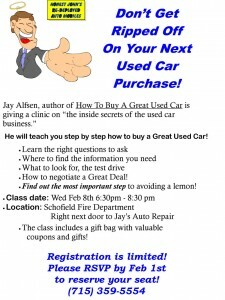 Jay Alfsen has written the book, literally, about used cars and is sharing his knowledge with the general public at his free clinic on Wednesday, February 8th from 6:30pm – 8:30pm at the Schofield Fire Department in Schofield, WI. How to negotiate a Great Deal! Find out the most important step to avoiding a lemon! The class includes a gift bag with valuable coupons and gifts! Registration is limited! Please RSVP by Feb 1st to reserve your seat by calling Jay’s auto at (715) 359-5554. Watch for the RelyLocal Wausau ads! How To Buy A Great Used Car “, I will definitely read it.